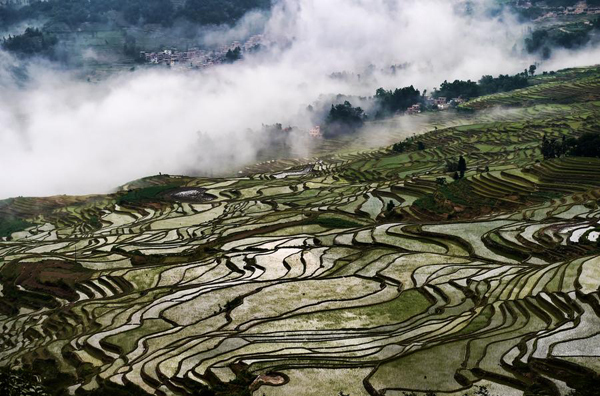 The cultural landscape of Honghe Hani Rice Terraces, system of Hani rice-growing, covers 16,603 hectares in Yunnan province. It is famous for spectacular terraces that cascade down the slopes of the towering Ailao Mountains to the banks of the Honghe River. The cultural landscape of the Honghe Hani Rice Terraces was added to the list on June 22, 2013. Over the past 1,300 years, the Hani people have established a complex system of channels to bring water from the forested mountaintops to the terraces. An integrated farming system was also created, which involves buffalos, cattle, ducks, fish and eel and supports the production of red rice, the area's primary crop. The inhabitants worship natural phenomena such as the sun, moon, mountains, rivers, forests and fire. They live in 82 villages between the mountaintop forests and the terraces. The villages feature traditional thatched "mushroom" houses. Through the resilient land management system of the rice terraces, we can see extraordinary harmony between people and their environment, both visually and ecologically, based on exceptional and long-standing social and religious structures. The Honghe-Hani terraces reflect elaborate and finely tuned agricultural, forestry and water distribution systems that are reinforced by long-standing and distinctive socio-economic-religious systems. Red rice is farmed on the basis of a complex, integrated farming and breeding system. Ducks fertilize the young rice plants, chickens and pigs contribute fertilizer to more mature plants, water buffalo slough the fields for the next year's planting and snails in the water consume various pests. The elaborate socio-economic-religious systems sustain rice growing process and strengthen peoples' relationship with the environment through obligations to both their own lands and to the wider community, and affirm the sacredness of nature. This system of dual inter-dependence, known as the "Man-God Unity social system", and its physical manifestation in the shape of the terraces together form an exceptional living cultural tradition. The Honghe Hani Rice terraced landscape is an exceptional demonstration of interacting with the environment and integrating farming and water management systems. Underpinned by socio-economic-religious systems that show the dual relationship between people and gods and between individuals and community, the system has persisted for at least a millennium, as can be shown by extensive archival sources.